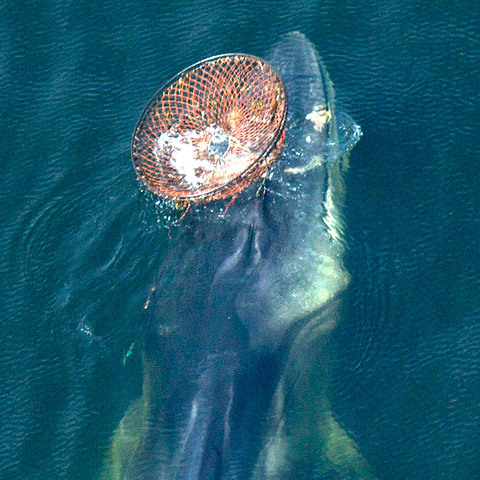 PICTURE (CREDIT GREMM) : Female fin whale (Capitaine Crochet) with a large crab pot caught in her mouth. “Capitaine Crochet”, a female fin whale that is well known by researchers and outfitters since 1994, has not been seen since June 13. This whale was first sighted this year badly entangled in a fishing gear in Québec’s Saguenay- St. Lawrence Marine Park on June 6. A team composed of representatives from Parks Canada, the Department of Fisheries and Oceans, the Groupe de recherche et d’éducation sur les mammifères marins and the Quebec Marine Mammals Emergency Network had been closely monitoring this incident. The fin whale seemed to not be in optimal body condition, which might be seen as a sign of sickness. However, since fin whales are often in lean body condition when arriving on their summer feeding ground, it is not believed that this is caused by the entanglement. Based on fishermen reports, the gear that was attached to Capitaine Crochet had only been missing since May 20th. A team formed by different groups with expertise in disentanglement tried to rescue this animal. Several attempts to approach this free-swimming whale over a period of a week were not successful. The fact that the fishing gear is located close to the head increases the complexity of this case. In addition, fin whales are fast swimmers and are often very difficult to approach by rescue vessels, and Capitaine Crochet is no exemption to this. The plan was to try to “capture” the gear with a hook attached to a long rope with buoys equipped with a transmitter. These buoys would have facilitated the localisation of the whale by the intervention team. Unfortunately, it was not possible to approach the whale close enough to do this. Aerial pictures taken suggest that the rope is deeply embedded in the flesh of the upper jaw. This is believed to be a life threatening situation. The gear is most likely interfering with optimal feeding and the wounds associated with the embedded ropes could lead to systemic infection. In addition, if the ropes progress into the bone of the upper jaw there is a risk of fatal hemorrhages since large arteries that could be severed by the rope are present in this region. The fate of Capitaine Crochet is currently far from certain; the last sighting was over two weeks ago; boat and aerial surveys have failed to locate the entangled whale. Hopefully, Capitaine Crochet will be seen again in the coming weeks so the intervention team could attempt to free her again. Accidental entanglements with fishing gear kill or injure several whales each year, representing the most commonly documented cause of mortality in all eight species of large whales monitored in the Northwestern Atlantic. From 1970 to 2009 a total of 323 mortalities of large whales were documented to be associated with entanglements. The situation in the St. Lawrence Estuary and Gulf is not well known; between 3 to 20 cases of entangled whales being reported each year.